At long last, we have the final installment in Marissa Meyer's excellent Lunar Chronicles quartet. This tome delves deeper into the story of Princess Winter, the stepdaughter of the terrifying Queen Levana of Luna. Winter refuses to use her Lunar gift, and as a result she struggles with Lunar Sickness, a mental illness that causes vivid hallucinations and confusion in those who suffer from it. 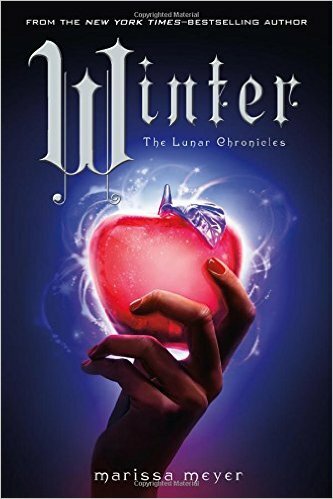 Winter also has the misfortune of being extremely beautiful and very well loved by the people of Luna, earning her the jealousy and hatred of Levana. And so, this Snow White tale follows the bones of the original: the queen orders her beautiful stepdaughter killed, only to have the one ordered to do the killing unable to go through with it and create a ruse to save her. Of course, Winter is also the conclusion to the other three stories that began in the previous entries in the series. Cinder is still at large, accompanied by Cress, Thorne, Kai, Iko, and Wolf. Scarlet is still imprisoned in the royal menagerie as Winter's pet. And Levana is after total control. This was an intensely satisfying ending to what I think is a fantastic series. Meyer expertly retells the original folktales, cleverly bringing them into the sci-fi world she has created. All of the characters are extremely well rounded, including the villains, and the action and battles get super intense. I also loved how the relationships keep maturing and growing throughout. My favorite has to be Thorne and Cress, though Scarlet and Wolf are just lovely too. And I still love Iko. The narration by Rebecca Soler is great. She has distinct voices for every character, and I could easily pick out who was talking. She has great pacing and an attractive voice. I went after the audio editions of each of the books in this series because I enjoyed listening to her interpretations so much. The only thing I thought was kind of weird was her decision to give Kinney, a guard on Luna, an Irish accent. Why? Aren't they all from Luna? Why would he have an accent from Ireland in that case? Minor quibble, especially since I can't complain really about listening to a well-done Irish accent, but it threw me off a bit. I was very pleased with how things turned out in the end. I am very much looking forward to the collection of short stories that will be released in February, titled Stars Above. Disclaimer: I got this CD audiobook from my local library. Great review! I loved winter and I can't wait for stars above! Kinney's accent threw me off, too! Maybe there's an untold story there?